We have covered the importance of keeping your Rolex bracelet clean here on Beckertime over these last few years. Unlike other items that people wear, the reasons for keeping your Rolex bracelet clean are not apparent. It is not like a Rolex bracelet becomes visibly dirty with the notable exception of gold links becoming tarnished, but inside the bracelet links, something else is going on that is not visible to the naked eye. Wiping off your watch and bracelet when it starts to tarnish with dirt and gunk is obvious. What is not obvious is that the same gick that is wiped off the outside of your watch is also inside the bracelet links. On Rolex Jubilee bands, there are plenty of places for dirt and grime to collect over the months, yet is invisible when looking over the watch. The same is true with the older, folded-stainless hollow links found on pre mid-2000 Rolex straps where gunk collects inside the links. Although the newer Oyster bracelets with solid links appear to withstand dirt getting inside the link, dirt still collects inside the bracelet pins and inside the milled clasps. Dirt inside the bracelet causes premature wear as the bracelet has metal-to-metal friction when the watch is worn. Dirt and grime inside the bracelet links causes what is known as “elongation,” whereby the link pins and holes inside the links become loose because dirt acts like sandpaper, making the holes slightly bigger. Elongated holes might be only a fraction of a millimeter over time, but when combined with the same wear on all the links, the bracelet appears to lengthen which is more commonly known as “bracelet stretch.” The bracelet really does not stretch, but rather is the sum of all the combined wear of the bracelet pins. One method to clean the inside of the bracelet is to let the bracelet soak in a solution of warm water and ammonia or rubbing alcohol. While the bracelet soaks, swish the bracelet around in the solution so that water turbulence swishes through the links. Letting the bracelet sit in the solution for a few hours allows the solution to eat away at the dirt collecting inside the Rolex bracelet. After soaking, wipe the bracelet and watch head down with Veraet watch cleaner. Veraet is specially formulated for cleaning wristwatches. We have covered Veraet before on Beckertime here. The best way to clean a Rolex bracelet is to remove the bracelet, and use an ultrasonic cleaner. 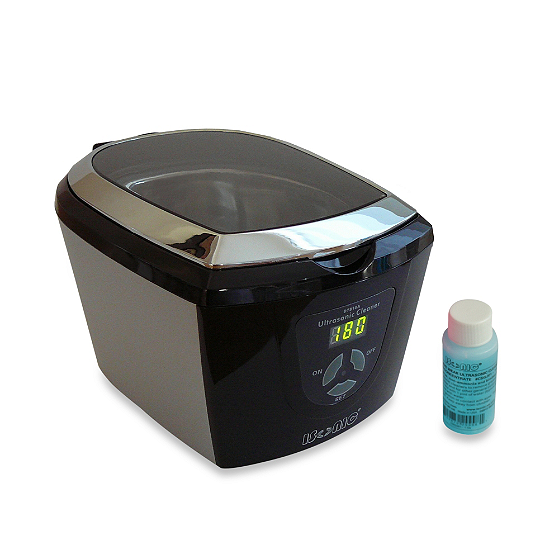 An ultrasonic cleaner removes dirt and grime using sound waves. Ultrasonic cleaners are found in dentist offices, jewelry dealers, and optometrist offices among other places as they are one of the best, unobtrusive methods for cleaning metal. Removing a Rolex bracelet is not too difficult if you have the correct tools. Beckertime describes how to remove a Rolex bracelet here. The advantage of an ultrasonic is that the process cleans down to the metal removing dirt and grime where you cannot see it. An ultrasonic cleans inside the links where a rag or bush does not reach, and it cleans down to the metal without wiping. Wiping down a Rolex removes dirt, but over time there is more dirt and grime that a cloth doesn’t catch and dirt is really spread around with a coating thinner than what the eye sees. An ultrasonic with a touch of ammonia or grease cutting soap, cleans down to the metal and is visibly cleaner like when the watch was new. Because a mechanical Rolex watch has oils inside the case, and older Rolex’s might have fragile lume on the dial and hands, do not put the entire watch inside an ultrasonic. A Rolex watch will survive an ultrasonic cleaning, but the soundwaves will displace oil and possibly the SuperLuminova or Chromolight applied to the dial indices and hands if performed repeadedly over time. An ultrasonic is best for a Rolex bracelet and clasp only. Ultrasonic cleaners vary in price depending on quality, but a home use ultrasonic is well below $100 and found on eBay, Amazon, Bed Bath and Beyond among many other retailers. Ultrasonics are also used for cleaning razor blades, eyeglasses, diamonds, and other household item, but they do a great job on Rolex bracelets. Using an ultrasonic is the best method for cleaning a Rolex bracelet.